Bringing the chutzpah back to gluttony!! I have always had a penchant for all things different. If its not different, I am simply not interested. So when it came to baking my first scones, I would never start with the simple basic scones. I started with improvising an apricot scone recipe with white chocolates. I was happy with the result. 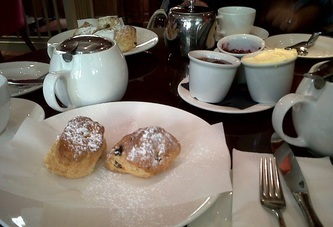 Now, fruit scones aren’t very popular in common tea cafes. This is a shame, especially because they have such a vivid aroma and taste. I personally find fruity scones tinglingly refreshing. A friend of mine finds it very amusing how I love to ‘feel’ the taste of food as such and then describe it. I personally feel that feeling food while eating it helps develop a connection with it and you enjoy the experience more. That is of course, if you like the food your eating. So coming back to fruity scones and apricots... Apricots or Prunus armenaica (as they are scientifically known) are beautiful velvety orange coloured cousins of plums and peaches. Nutrition wise, I consider dried apricots as a giant magic pill (along with almonds). 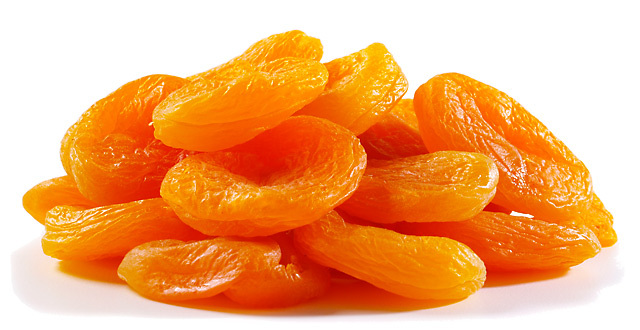 Apricots contain highest amount of beta-carotene, an anti-oxidant which is instrumental in preventing heart disease. Beta-carotene helps protect LDL cholesterol from oxidation.Working with oxidised-LDL at cellular level myself, I have to admit the damage it can cause to cells is substantial. You only has to pubmed oxidised-LDL and disease, and you’d know what I mean. Apart from protecting from oxidative stress, apricots are an extremely good source of Vit A and Iron, even more so when dried. Extremely good snacks for the calorie conscious, these fat free dried fruits only contain 20 kcal each. I am no expert (mommy dearest is) but, I feel apricots and almonds are essential part of any healthy diet. High fibre content in apricots only adds to the ‘sone pe suhaaga’. To sum it, an apricot a day, keeps constipation at bay ;-). A little trivia- In China, the nectar of Gods is supposed to be made of apricots. Apricots were also used for their supposed aphrodisiac properties in Europe. Infact, Shakespeare's play, A midsummer's night dream even uses them in this context: "Be kind and courteous to this gentleman; Hop in his walks and gambol in his eyes; Feed him with apricots and dewberries, with purple grapes...And for night-tapers crop their waxen thighs. And light them at the fiery glow-worm's eyes, to have my love to bed and to arise"
Sift flour, baking powder, salt, sugar in a bowl using sieve. Pour butter and rub it in gently, till it has a breadcrumb consistency. Mix yoghurt, egg and vanilla extract and add it to the other bowl. fold in the chopped apricots and white chocolate. Use a cookie cutter (or a Nescafe lid works just as well) to cut out scones. Place it on a buttered and floured baking tray. Glaze scones with a mixture of egg, milk and sprinkle sugar lightly on top. Bake for 15-20 minutes until well risen and golden brown. Cool on a rack and enjoy with clotted cream, lemon curd and strawberry jam. 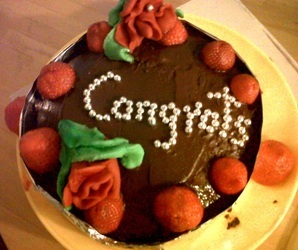 Q-What do you call a cake that goes really fast? Jokes apart, Scones are the quintessential british treat. No high tea is complete without this innocuously plain looking thing. On my first look, I wasn’t impressed. 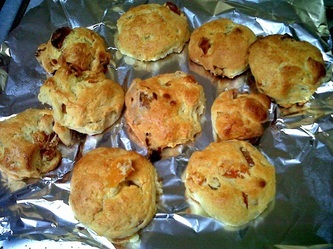 A scone looks like a sort of mutant cross between between an overblown biscuit and a crumpet. Taste is however another matter altogether. A fresh well-made scone is the stuff legends are about. And I am not exaggerating. Fresh and well-made scones are also hard to come by. No, that stuff you get in Tescos or even Waitrose? That is not what I am talking about. They are just substandard ‘kaala dhabbas’ (excuse my hinglish) on the name. The real beauty of a well-made scone lies in its absolute freshness and a light feather like crumbly texture. This is why it is impossible to get good scones in supermarkets. In my dictionary, a scone that isn’t fresh isn’t a scone worth eating. Another thing that the romantic in me loves about scones (pronounced as ‘Skoans’) is that it wasn’t designed to be eaten alone. Just like it takes two to tango, a scone is best enjoyed in pairs with ladles of cream. And jam. Whoever said three is a crowd had never tried scones with clotted cream and strawberry jam. More is best when it comes to cream and jam topping on the scone (not the savoury ones of course but I’ll come on that a bit later). Yes, I am going to encourage you to treat your tastebuds and indulge in the cardinal sin of dollops of cream with that scone in your hand along with your evening cuppa tea. It’s the perfect tea-time quickbread to be enjoyed with friends and family. Interestingly, one of the ‘great scone confusions’ is what do you first put on a scone? Traditionally, its jam first, followed by cream. I prefer it that way too but then to each there own. Food is best experienced your own way! So where really did this flat flat round fine flour cake originate? Some people say it took its name from the Stone of Destiny (or Scone), the place where Scottish kings were once crowned (and yes, there exists a palace of Scone). While others link its origins to the Welsh yeast cake ‘Baramaen’. The Oxford English Dictionary traces the word "scone" in print to 1513 to Aeneid, a book by Scot poet Gavin Douglas which describes the fine flour cake: The flour sconnis war sett in, by and by, wyth other mesis.' Others say it derives from from the Dutch or German words for ‘fine/beautiful bread’ (‘Schoonbrot’ and ‘Schonbrot’, respectively) or from the Gaelic ‘Sgon’, meaning ‘large mouthful’. No matter the origin, the Scot connection to this English pride is unmissable. Making those beautiful frosting cake decorations is an art; however, thanks to Marzipan even novices (like me) can try their hand at it. And yes, if it sounds German, chances are it is. Marzipan is German for Marchpane or March loaf. Modern day marzipan is known to have originated from German city of Lubeck. Lubeck Marzipan is one of the finest in the world and is protected by EU’s PGI since 1996. It’s basically a thick almond paste made of sugar, almonds and almond oil. The texture reminds me a lot of the kajoo-barfi back home. Apart from its use in chocolates and icing Christmas cake, marzipan makes for a malleable easy to use medium for cake decorations. I’ve grown up a fair bit since my childhood days of Disney character cakes and dinosaur cakes (Chocolate Stegosaurus anyone?).. 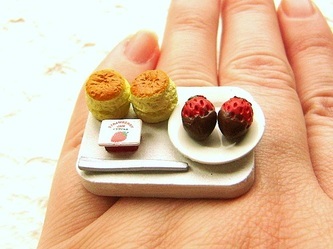 Yet, I am still intrigued by hand modelled cake figurines. So a bridal shower for a friend meant I got to try my hand at making, ‘not so tiny’ Marzipan roses to decorate. Being my first attempt I didn’t expect a lot but I was happy with the finished product. 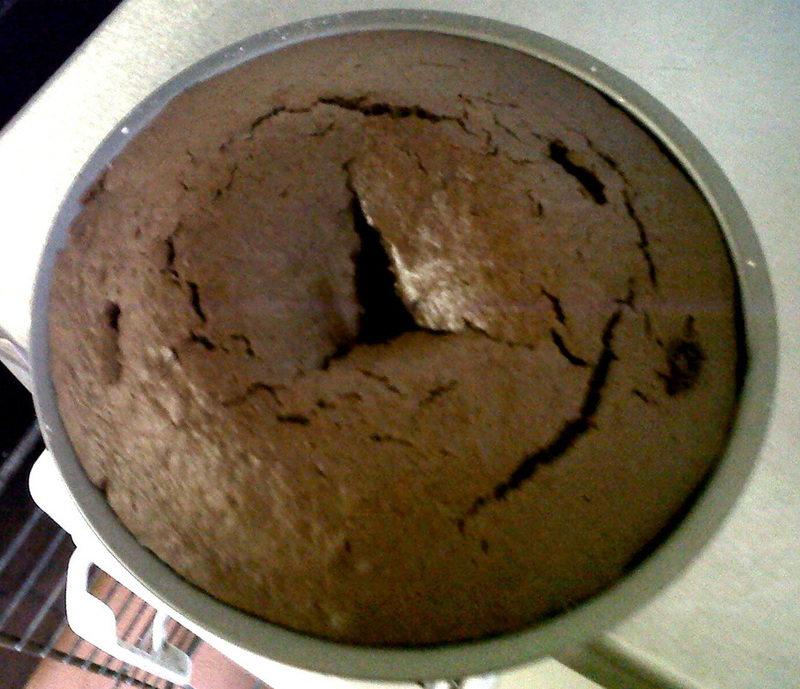 The base cake was a simple chocolate sponge cake. Pre-heat oven to 180 degree Celsius. Line the cake tin with baking paper or sprinkle oil and flour on bottom and sides. Seive flour, sugar, and baking powder and mix with melted butter and milk. In another bowl, whisk oil, egg, vannilla and coffee. Mix the contents of the two bowls by whisking. Fill the cake tin with batter and bake for 1 hour 10 minutes. After the cake is baked, keep it aside to cool down and prepare for icing by melting chocolate, vanilla essence and butter and whisking it. 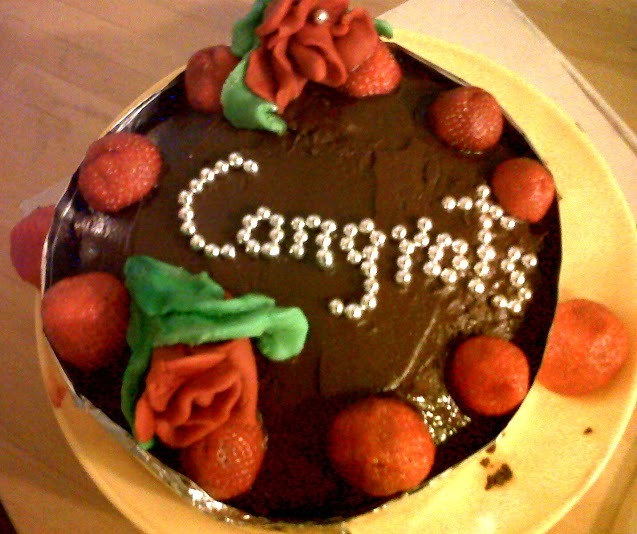 Spread it on the cake with knife. Decorate with silver sugar balls and strawberries. To make roses, break away marzipan and knead with sugar and food colour. Mould with hand to make the roses. Nutellaaah- This is one spread like no other. As my flatmate Chris loved to say- "Nutella? Everything goes with Nutella!". 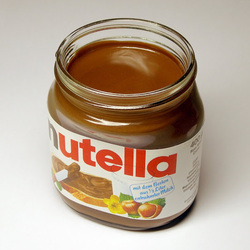 This hazelnut chocolatey spread was introduced by the Italian company Ferrero (yes, of the Ferrero Rocher fame) in 1963. Soon there was no looking back. For the Nutello-holics at least. Nutella took over the world and made peanut butter look like a pale cousin (No offence but I am one of those who choose Nutella over Peanut butter anyday!). This hazelnut spread tastes very chocolatey but is not a 'chocolate spread' due to the low concentration of cocoa. At 7.4% its not eligible to be marketed as a chocolate spread. The other contents of Nutella are whey powder, skimmed milk, vegetable oil and a whooping 55% of sugar. No its not for the calorie conscious. Having said that, its a great for a kick-start breakfast in the morning when your metabolism is in shape for the upcoming day. So I brought a jar to kick-start my rush hour mornings. The only trouble is that once u start. Nutella doesn't let you stop. So unconscious Nutella spoon scooping was short of becoming a habit. 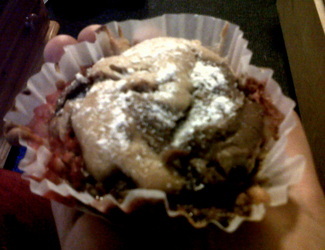 It was time to eat it or flee it and flee it t'was.Now strawberry and nutella to me are a match made in heaven. 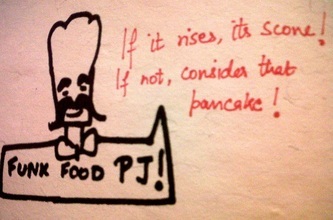 Add to it a tiny dash of coffee and in an ideal world its a foodie delight. With its soft delicious nutella centre, you don't just want to stop with one. Pre-heat oven to 180 degree Celsius. Line muffin tins with baking paper muffin liner. You can put some butter on bottom to make it stick to the tin. 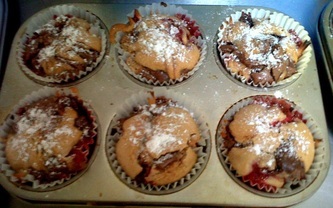 Mix flour, sugar, salt and baking powder after seiving. In another bowl, whisk oil, egg, vannilla and coffee extract. Mix the two together by whisking. Fill half of muffin cup with batter and add a teaspoon of Nutella on top. Cover the nutella with more batter and make a twirl using fork. Bake for about 20 minutes till the top looks golden browny. Check with a fork, it should come out clean. Coming from a country where the word food is synonomous with spices and amalgamations of aromas and flavours, I am always pleasantly surprised by food from the Mediterranean region. Mediterranean food though sans infusions of spices retains its simplistic yet delicately delicious flavour. Although, I am a die hard spicophillic, yet trying a simple savory dish of Trahana soup prepared by a Greek friend(with hint of lemon and home made bread) has reinforced my belief that more doesn't always translate merrier- especially when it comes to spices and flavors. 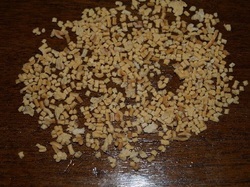 Trahana is a type of fermented granular pasta which amongst other things can perhaps be called as world’s first dessicated soup. The word can possibly be traced to the ancient Greek word trakton or tragos which means grain. Trahana is prepared by mixing flour, egg, with milk or yogurt or butter milk; letting the mixture ferment; then drying, grinding, and sieving the result. The fermentation produces lactic acid and other compounds giving tarhana its characteristic taste. The low pH and drying results in a medium inhospitable to microorganism growth and at the same time preserves the milk proteins. It is very popular in Greece, Cyprus, Turkey, Persia and there are different varieties of it with flavors ranging from sour to sweet. An interesting legend pertaining to Tarhana which I came across mentions the origin of this popular dish as follows: Once upon a time, A king, whilst on a military operation was a guest in the home of a poor peasant . Having little to offer, the resourceful peasant housewife quickly boiled up a soup. Embarrassed at having to make such a meager offering, she said, “‘Dar hane’ soup is all I have to offer you, my liege. May you eat it with appetite!” In time this ‘dar hane’ soup became known as Tarhana and soon came to head the list of staple nourishments of both settled and nomadic people living in the Mediterranean region. My blog for all things edible!